Marcus Whitman Chapter, NSDAR is extremely proud of 100+ years of continuous charitable work and sorority in the greater Everett area. Learn more about some of our past service projects below. Including the donation in 1915 of a stone monument placed at Grand Avenue Park to honor Captain Vancouver’s 1792 arrival in Port Gardner Bay and, in 1931, the donation of the Point Elliot Monument in Mukilteo to mark the Point Elliot Treaty site, recent projects have included the restoration of our organizing regent’s grave marker in the historic Evergreen Cemetery. We have recently completed the work on a project honoring Civil War veteran, Robert Beecham, whose final resting place is also in Evergreen Cemetery. The Marcus Whitman Chapter believes that patriotism goes beyond saying the Pledge of Allegiance and standing for the presentation of our country’s flag. Our patriotic service includes: honoring and supporting veterans and active-duty military through DAR Project Patriot and Wounded Warrior; sending handwritten holiday cards to wounded service men and women at Landstuhl Regional Medical Center in Germany; presenting JROTC, Sea Cadet, and Navy League awards to students in Snohomish County. 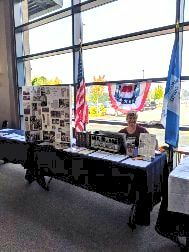 In addition, we provide informational displays for Constitution Week in local libraries. We proudly march in the Snohomish Kla Ha Ya Days Parade and distribute miniature U.S. flags to the crowd to honor participating veterans groups. We recognize outstanding members of our community for their service. We raise funds and support local community service projects. Our chapter was honored to have its nominee, Mrs. Noemi Ban of Bellingham, holocaust survivor and public speaker, selected to receive the 2010 NSDAR Americanism Award at the state and national levels. We offer genealogy workshops throughput the year to assist those interested in researching their family history. We are always happy to provide advice and one-on-one assistance to women interested in joining our chapter with the preparation of their application papers. Chapter Registrar Eileen Quayle, hosting one of her prospective workshop at the Everett Library. Prospective workshop at the Everett Library. The chapter's Volunteer Genealogist, Joan Peters, lending us her knowledge. A portion of our annual chapter dues and donations are used to support the many educational scholarships and other projects of the National Society of the Daughters of the American Revolution. We were so pleased to have been able to acknowledge the outstanding efforts of Lake Stevens High School history teacher, the late Mr. James Talley. We look forward to honoring more extraordinary American history teachers in coming years. We have collected books and donations for various literacy projects, and we encourage adult learning through our educational programs at each chapter meeting. Mr. James Talley of Lake Stevens High School receives the Outstanding American History Teacher Award in 2012.